Indu Devi made her living producing fox nut snacks, but cultural gender norms held her and other women entrepreneurs back from business success. With access to formal financing and business training, she's integrated her enterprise into a profitable snack company. Traveling northeast in the state of Bihar, India, ponds and wetlands begin to dot the landscape. The surfaces of these stagnant waters are covered with the large, round green leaves of the Euryale ferox, a flowering plant in the water lily family. More than simply picturesque, this unique landscape is also an agribusiness opportunity that is providing women entrepreneurs in India a pathway to improving their household incomes and status. Native to the region, this prickly water lily yields starchy, white edible seeds – commonly known as fox or gorgon nuts – that have been used in traditional Ayurvedic medicines for thousands of years. The fox nut has been farmed for generations, and is a traditional livelihood for rural women like Indu Devi who depend on fox nuts as a source of household income. In fact, Indu Devi’s village of Madhuban produces 500 tons of fox nuts each year. Indu Devi’s family has been in the fox nut business for more than 20 years, when they began collecting the seeds from ponds and selling the raw nuts. Over the years, they’ve expanded into fox nut processing, roasting the nut into a puffed nut snack known as makhana, which is widely consumed for its nutritious qualities and role in recipes for vegetable curries, milk desserts, and Hindu religious observances. 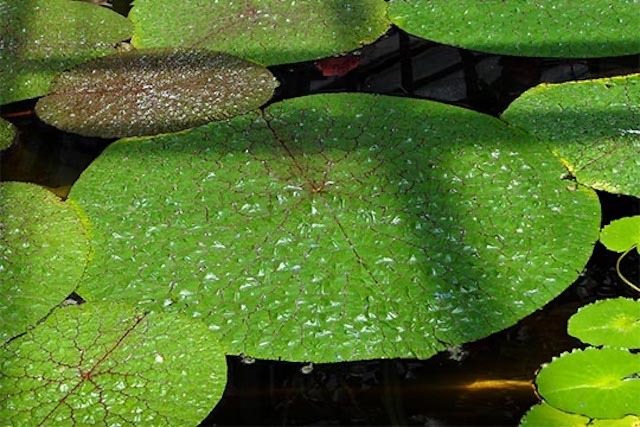 Native to the region, this prickly water lily yields starchy, white edible seeds that rural women have turned into a source of income for generations. 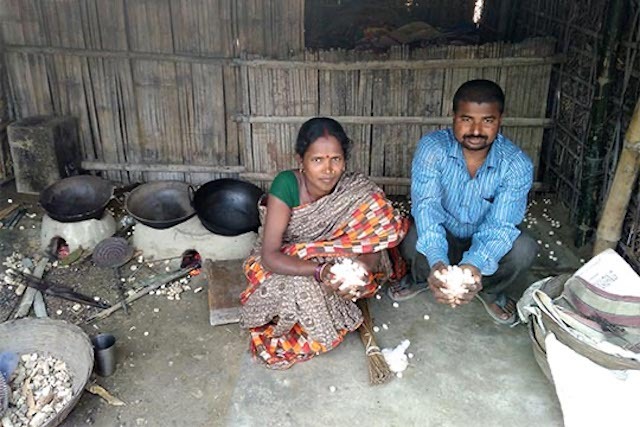 At just 32, Indu Devi has spent her late summers and early autumns harvesting and producing fox nut with the support of her husband, Manoj. A natural businesswoman, she’s mastered processing and marketing her crop, but her journey has been filled with challenges, and her success has been hard-won. The main barrier Indu Devi faced was lack of working capital. She was even forced to stop production at one point due to lack of funds. The reality of her region is that some of these obstacles are related to her gender. “Most women in our village find it difficult to start their own enterprise, as there are many social and cultural norms that inhibit us,” she explains. Traditionally, rural women are forced to go to the local money lender to borrow money at exorbitant interest rates, often amounting to between 40 and 50 percent per year. 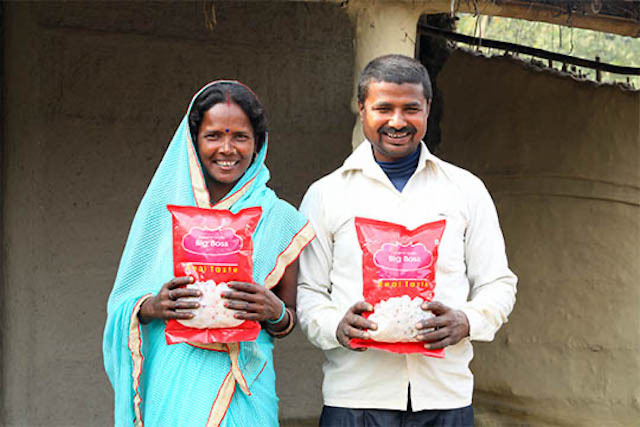 In addition, limited access to extension and training services held back Indu Devi’s business, production, and marketing skills, which – combined with a traditional lack of control over farm and household decision-making – left her unable to steer her business towards the success she dreamed of. 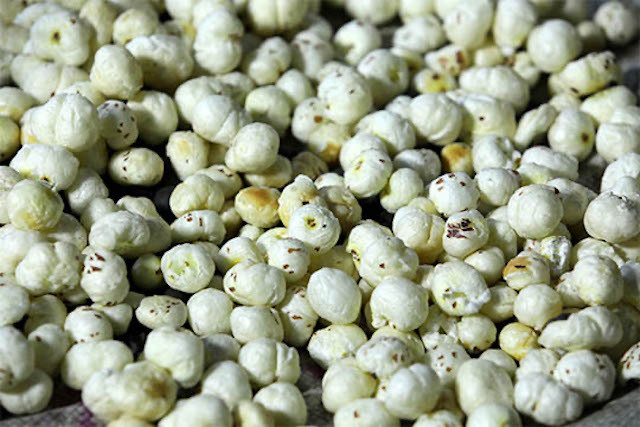 Makhana, a puffed fox nut snack, is also an important ingredient in vegetable curries, milk desserts, and Hindu religious observances. Aiming to improve the livelihoods of rural households and promote gender equity, TechnoServe is implementing the “Access to Finance for Women Entrepreneurs in Bihar” pilot project in the Purnea and Muzaffarpur districts of Bihar. Funded by Goldman Sachs India, the project works with farmer institutions and Producer Groups in the JEEViKA (Bihar State Rural Livelihood Mission) network in order to reach out to enterprising rural women, facilitate their access to much-needed financing, and provide the skills and tools they need to start a new business or grow an existing enterprise. A parallel effort of the program is to conduct a study on the challenges and opportunities women entrepreneurs face when obtaining financing in Bihar’s agri- and allied sectors. The pilot’s initial phase identified fox nut processing as a high-potential sector for women’s business growth. With a decades-old business ecosystem and local familiarity with the product, fox nut ventures could easily be adopted and scaled by aspiring women entrepreneurs. With previous experience in fox nut processing, Indu Devi was selected to participate in the program. 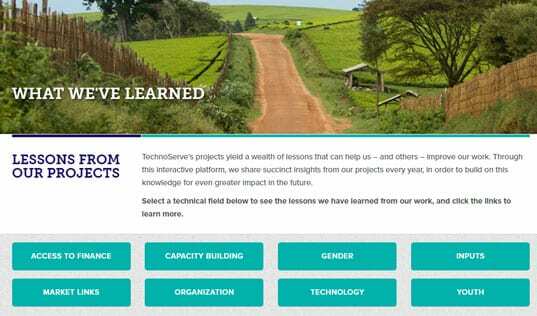 Along with 262 other women entrepreneurs, she set to work honing her business and financial acumen alongside TechnoServe trainers, developing essential skills such as submitting loan applications to formal financial institutions, managing constructive negotiations with bank officials, and pitching business plans. Indu Devi, who has expanded her business to integrate the entire fox nut value chain, has become a role model for other local women. Through training, technical assistance, and follow-up support from TechnoServe, Indu Devi successfully negotiated a loan for more than $1,000. A stark contrast from her previous loans with informal lenders, she now pays only 8.3 percent in interest each year, helping her to grow her business. 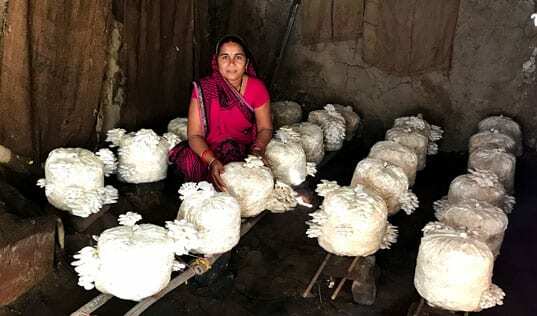 With increased confidence in her ability to pay back her loan – thanks not only to her improved interest rate, but also to her new business skills – Indu Devi is taking the initial steps in transforming her business aspirations into tangible success. 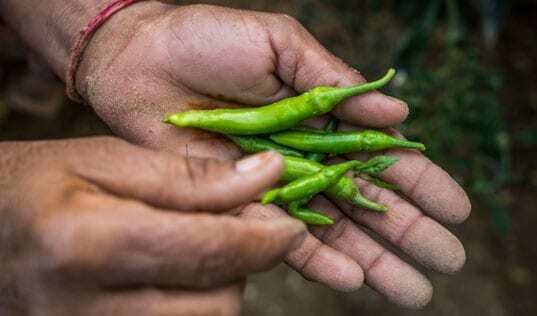 With access to greater working capital, Indu Devi invested in a lease for a new pond to grow fox nuts, as well as labor wages for cultivation, harvesting, and processing. With production booming, she has extended her business to cover the entire value chain, and is now selling puffed fox nuts in bulk and consumer packs. Beyond her own success, Indu Devi’s entrepreneurial spirit demonstrates how access to formal training and financing from formal financial institutions can improve livelihoods across the entire community. Indu Devi has become a role model for the women in her community. Her efforts have catalyzed their awareness around the business opportunity in fox nuts and other ventures, and many women in the village are interested in learning from her expertise. For her part, Indu Devi isn’t stopping any time soon. Despite leading the most profitable year in her family’s history (generating a profit of more than $750), she aims to lease another pond and double her profits next year. However, it’s not easy going. For four to five months in the year, Indu Devi rests for barely five hours a day. The rest of the time she is busy organizing, supervising, and directly handling all processing activities. “Yes, it is hard work, but when I see the fruits of my labor, I am motivated to strive even harder to advance my business. I now feel in control of my business and feel confident that I can repay loans of even higher amounts,” she says.